While combing the countryside for landscapes, we often run into interesting folks busy making a living. Photographing folks-at-work is of particular interest to us. Aside from the insight of how the rest of the country make ends meet, we feel certain some of these professions may disappear with the constant march of progress. Along the road in barangay Peñafrancia, just outside the municipality of Viga in Catanduanes, we chanced upon Oliver and his son Reymark. 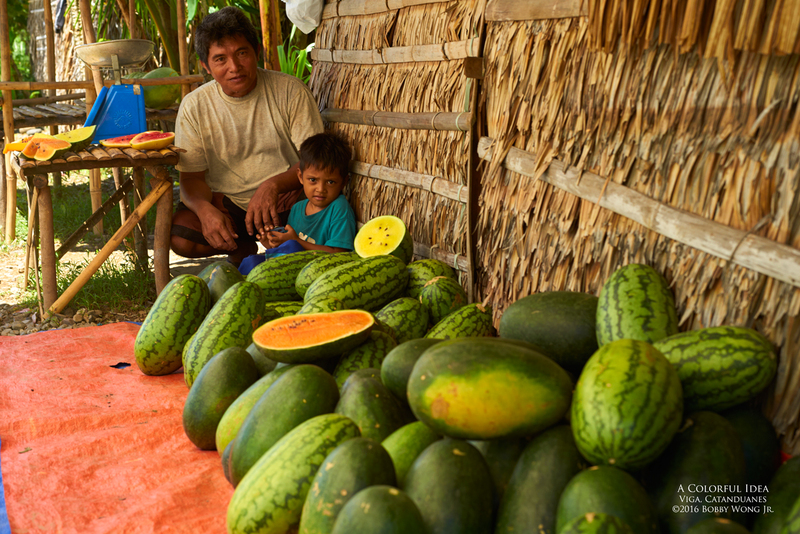 Oliver is a farmer who sought to differentiate himself by growing and peddling watermelon of several colors. We counted four: red, yellow, and two shades of orange, which in the noontime heat, were equally sweet and refreshing. Live long, watermelon farmers! Enjoy.